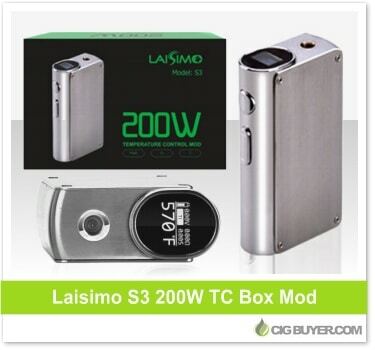 Maybe you weren’t a fan of the huge color screen on the Laisimo L1; if not, then you might want to consider the Laisimo S3 200W Box Mod. Like its sibling it fires up to 200W and can run Ni, Ti and SS coils in temperature control, but rather that having a large HD screen on the side it has a discreet OLED mounted on top. The toned down look almost resembles the Noisy Cricket Mod, but it has all the bells and whistles of a high-end regulated device. Powered by dual 18650 batteries, if offers massive power, tons of safety features and fires down to 0.05 ohms – with magnetic battery cover, spring-loaded 510 and more.